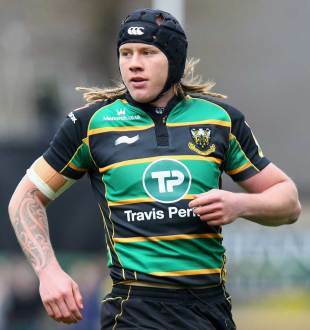 Northampton Saints back-rower Teimana Harrison has signed a four-year deal with the club. Harrison joined the Saints' academy last November and has since made four appearances for the East Midlands side. Although born in Opotiki in New Zealand, Harrison qualifies for England through his Nottingham-born father. After impressing for their A League side and the first-team, Harrison has now been awarded with a senior deal. "I've still got to get used to this weather but all in all I'm loving my time here," Harrison said. "I'm very excited by my new contract and it offers a lot of opportunities for me. Hopefully I can get some games during the season.I've thoroughly enjoyed my time in Northampton so far, and obviously my main aim is to try and get into the first team here at the Saints. That's what I'm focusing on at the moment." "Teimana has the hunger, desire and quality to be able to succeed in the Premiership," Northampton's director of rugby Jim Mallinder said. "When he arrived we could see straight away that he had all of the skills and raw talent, and now that he has had a full pre-season under his belt he is starting to take that to the next level. "We have had no hesitation in offering Teimana a full contract for the next two years, and hopefully he will remain a part of the Saints squad for a long time after that."